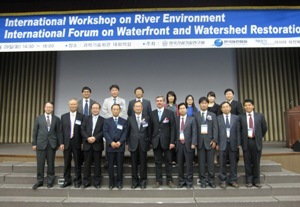 On September 30 (Wed.), 2009, the “Fourth Governing Council Meeting” of the Asian River Restoration Network (ARRN) was held in Seoul, Korea. First, each secretariat made a report on the activities of ARRN, as well as JRRN, KRRN and CRRN, after the Third Governing Council Meeting up to the present date. After that, Mr. Tamai chaired the meeting to hold deliberations and exchange opinions. 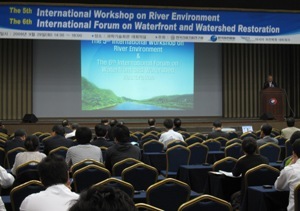 Through deliberations and exchange of opinions, we discussed various issues, including details of the International Forum for next year, the action plan for 2010 based on the policy of upgrading river restoration guidelines, and ARRN’s organizational framework, such as the chairperson and secretariat for next year. Dr. Baumann, who was a guest lecturer of the Sixth International Forum held on the previous day, participated in this meeting as an observer, and gave his valuable comments from the viewpoint of experiences in Europe.